2015 has been a beautiful, challenging year. More than any other year I feel like I have grown up in 2015. While I did recently celebrate a birthday that is getting pretty close to 30, it was some difficult experiences that really made me feel my age this year: navigating through challenging family circumstances, watching a close friend experience a scary medical diagnosis, supporting another friend through a life-altering break-up, talking through BIG life decisions with Adam, and thinking hard about what really matters and the kind of life that I want to live. It's been, in a word, heavy. But there has been lightness and fun, too. There were weekend trips to Charleston and Asheville, and the grand adventure of living in D.C. for the summer. I ran in two races, had dinner parties with friends, celebrated 10 years with my favorite person, and walked behind a waterfall in the North Carolina mountains. And, of course, I cooked and ate and shared lots of good food. 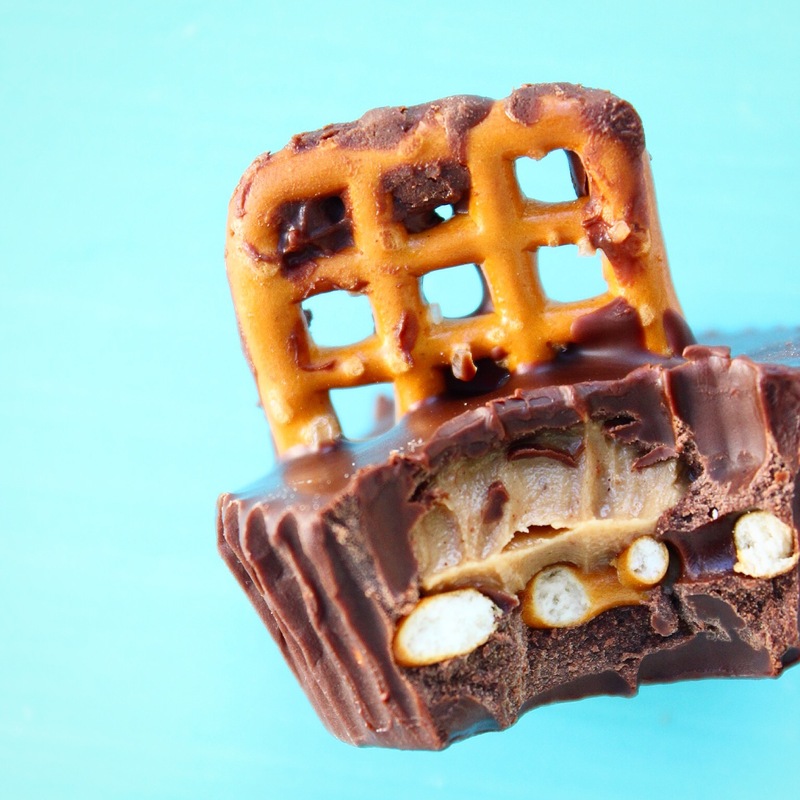 Here are the 12 most popular recipes on the blog from 2015. 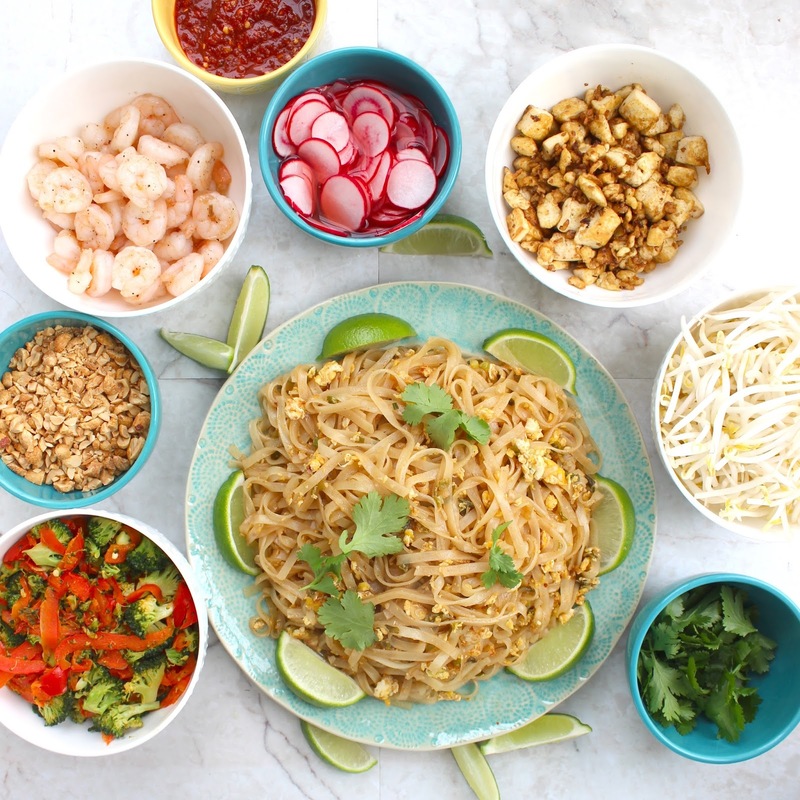 In need of something to cook for New Year's Eve? 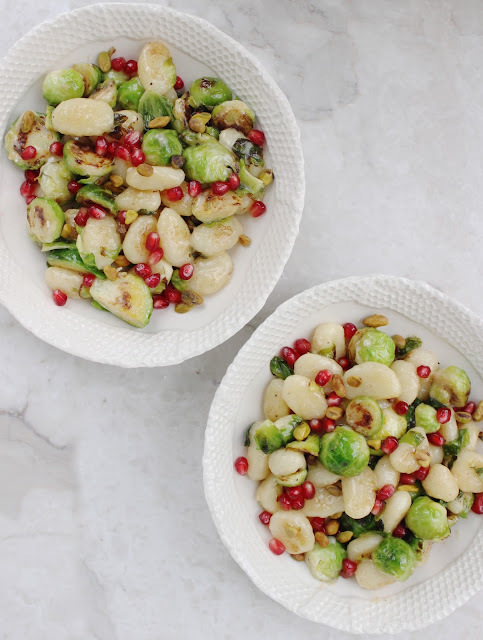 I've got you covered with this festive, decadent yet still healthy dish: gnocchi with brussels sprouts, pomegranates, pistachios, and parmesan cream sauce. Almost a year ago, I saw this instagram photo of this dish from one of our favorite restaurants in Charlotte, Good Food on Montford. I've been dying to make it ever since, although it's taken me a while to make the attempt. While the original version has duck and a lot of cream sauce, my version is vegetarian with a higher vegetable to gnocchi ratio. However, I still use real butter, cream, and some high quality parmesan cheese for flavor and richness. 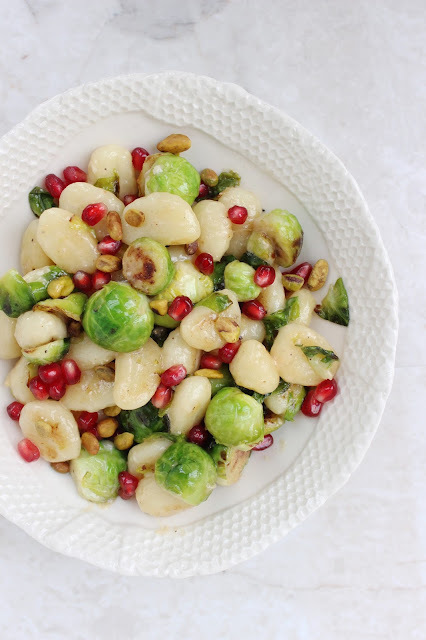 The potato pillows of loveliness and brussels sprouts are coated in a layer of creamy cheese sauce, with pistachios for crunch and pomegranate seeds for sweetness. 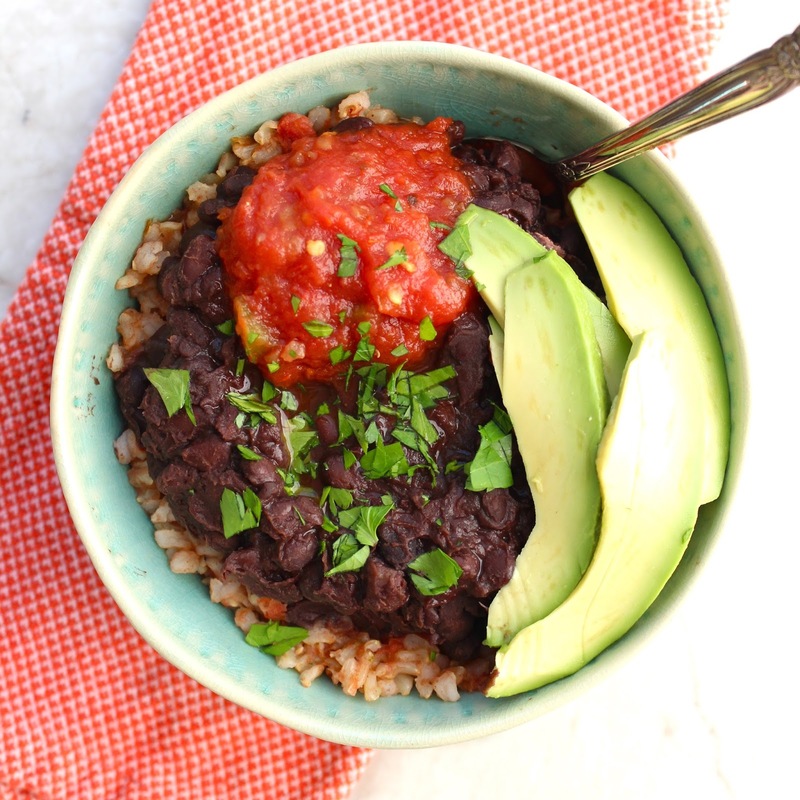 It's an elegant and colorful dish that is also quite easy to make. Because food photography requires me to be constantly chasing the sunlight, (which this rainy weather has made even more difficult!) 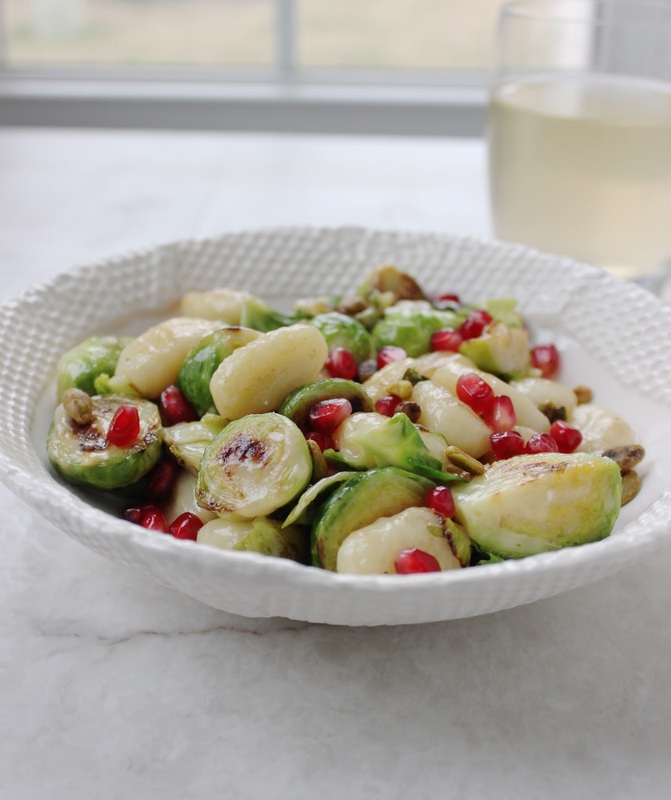 I chopped the brussels sprouts and de-seeded the pomegranate the night before, which made this recipe even faster to make. We just returned from a week-long trip with family, so our house is full of unpacked suitcases and miscellaneous gift boxes. We haven't vacuumed or swept the kitchen floor in weeks. Cook gnocchi according to package directions, being sure to add salt to the water. Drain and set aside. Add 2 tablespoons butter to a large saucepan over medium-high heat. 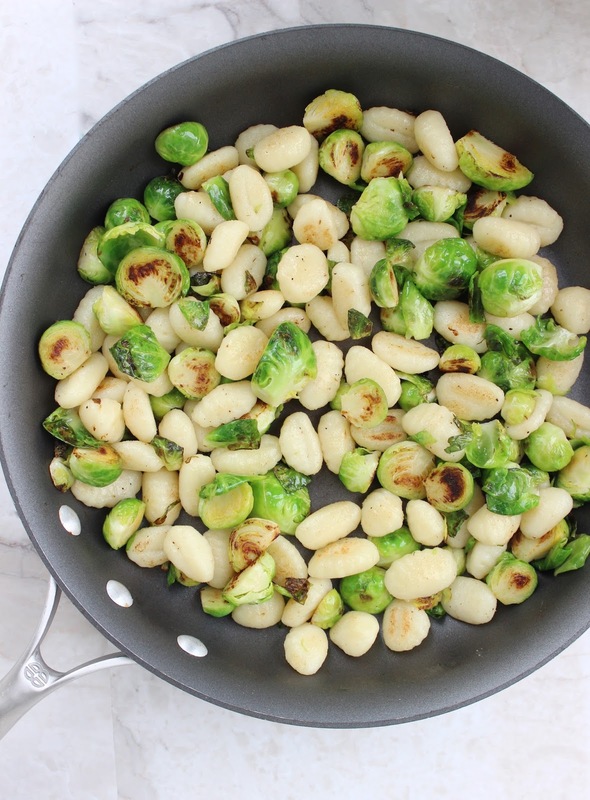 Once butter is melted, add brussels sprouts. Add salt and pepper to taste. (I like to turn all the brussels sprouts cut side down to that the cut side browns nicely first) Cook for 2-3 minutes or until slightly browned. Add the gnocchi. Continue cooking on medium high for another 2-3 minutes, or until brussels sports are starting to soften and the gnocchi is lightly browned. Serve plates of the gnocchi and brussels sprouts. 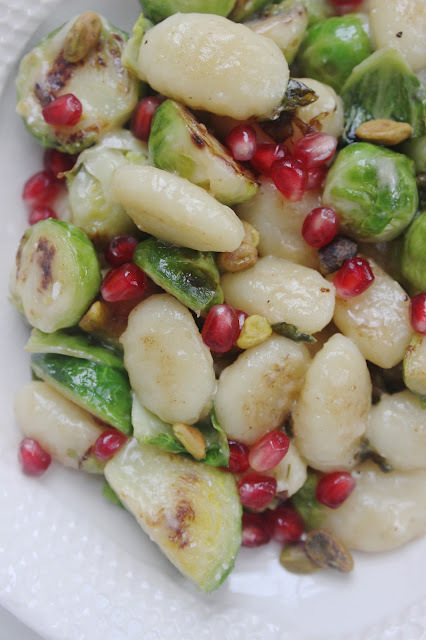 Top each plate with a handful of pistachios and pomegranate seeds. Inspired by Good Food on Montford, via Jen's Instagram. Hi friends. Despite the fact that I'm done with law school for the semester (!!!) life has been complicated and busy, and I haven't had time to make anything for you in the kitchen. 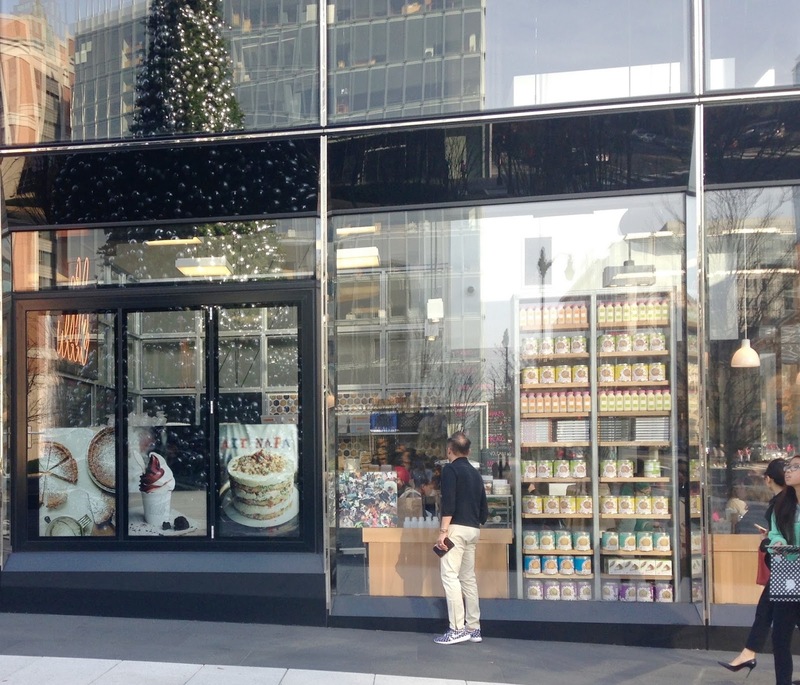 However, I just returned from a weekend trip to D.C., so I thought I'd share a few pictures of my foodie adventures with you. 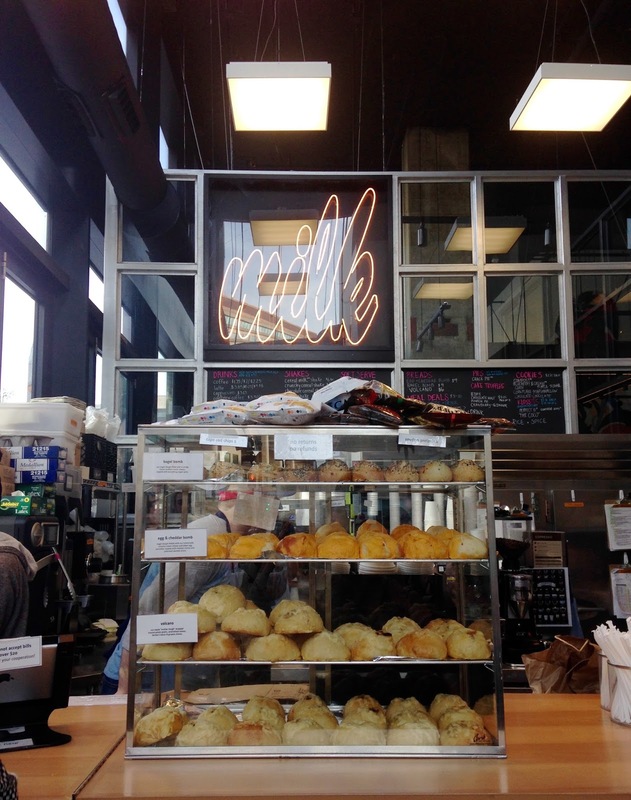 One highlight of the trip was getting to visit the Momofuku Milk Bar. 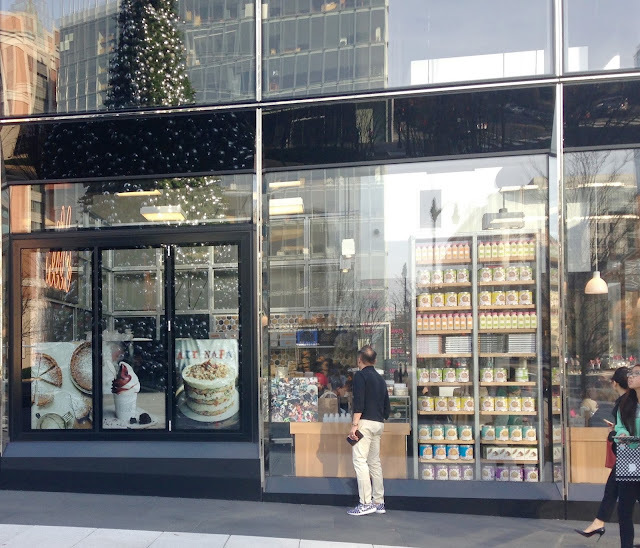 I've been wanting to try this trendy New York City bakery for several years after learning about master chef Christina Tosi. 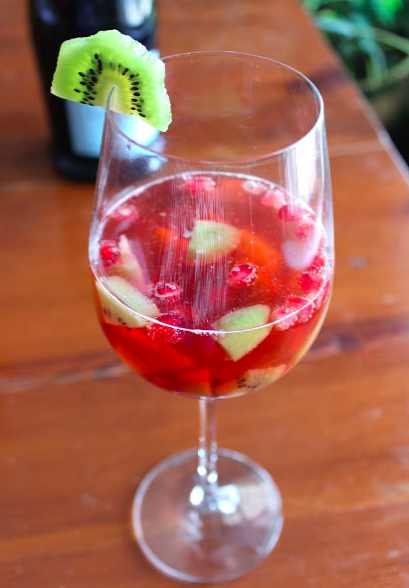 Her recipes are unique and inventive and I love supporting women in male-domainted careers. The D.C. 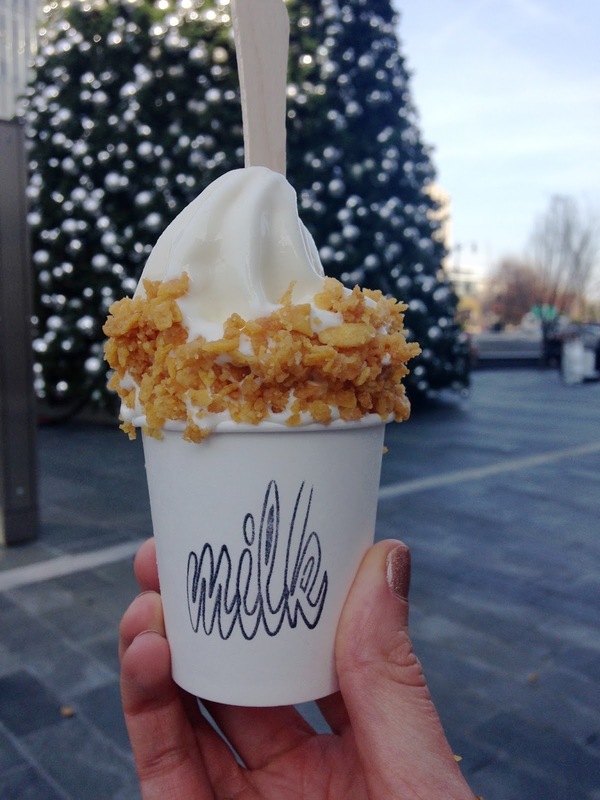 Milk Bar opened late this summer a few weeks after I left the city, and I was bummed to have missed it. Therefore, I was super excited to get to experience Milk Bar on this trip. I bought one of each variety of cookie, some birthday cake truffles, and this cereal milk soft serve. So good! 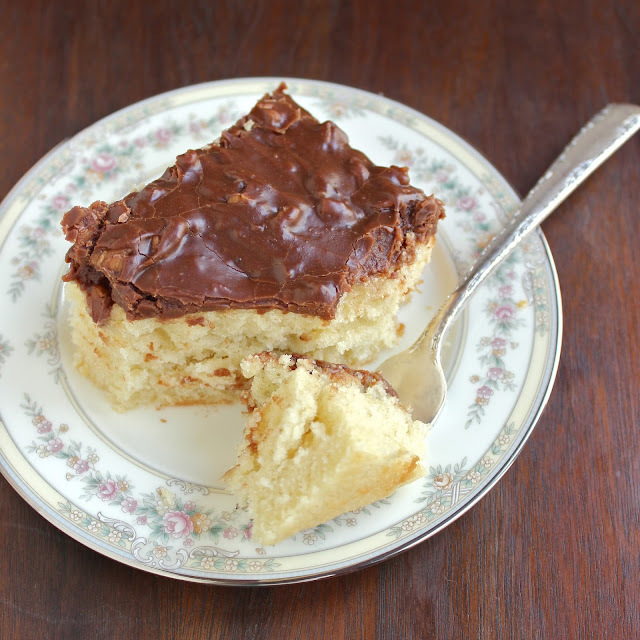 I've also heard amazing things about Christina's crack pie recipe. On Saturday night, my friend Tori and I went to a holiday gala at the French embassy, where I drank too much champagne and beamed when a cute french man with mustache called me "Mademoiselle." 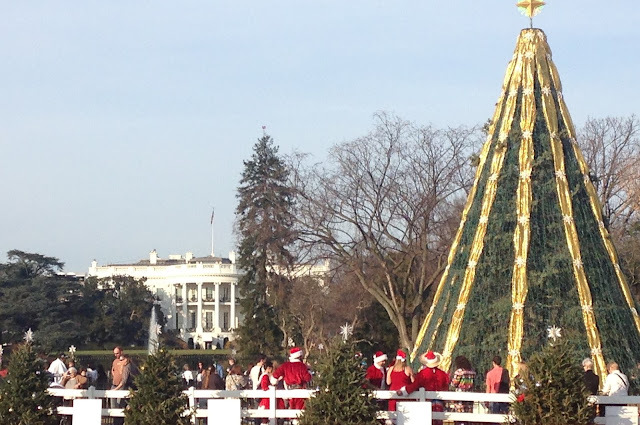 Over the course of the weekend, we saw ice sculptures, the national Christmas tree, and a random assortment of people in santa costumes for SantaCon. 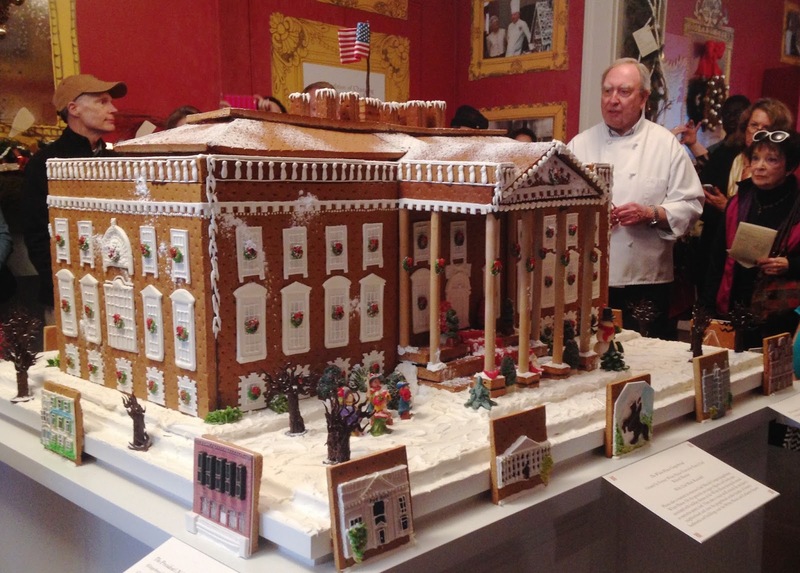 Finally, we met the former Whitehouse pastry chef and saw the Whitehouse Gingerbread. I was amazed to learn that the secret to holding all that gingerbread together is tempered chocolate that is applied like paint to the back of each piece. 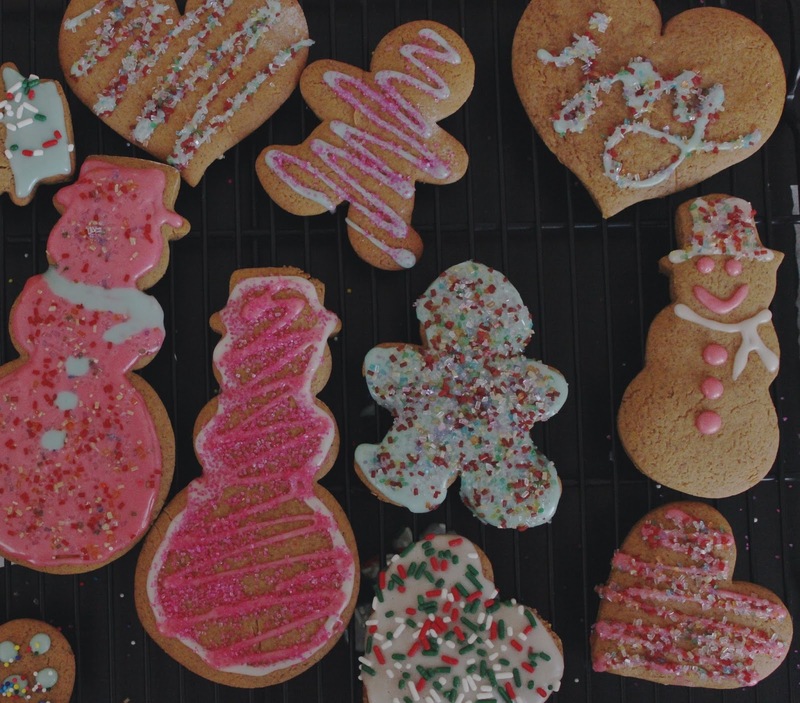 It works like glue and keeps the gingerbread from drying out or folding in the humidity! 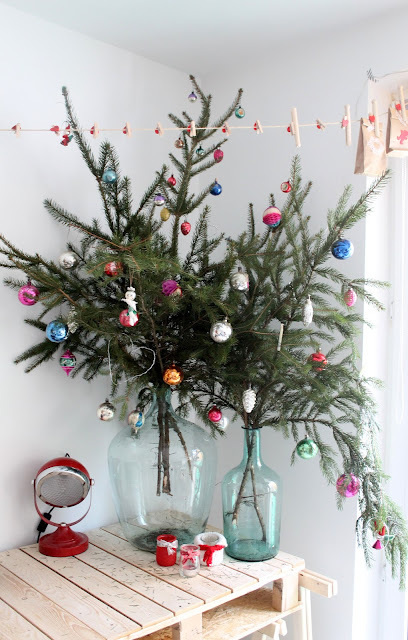 I hope you have a festive, fun-filled week. 10 days until Christmas! 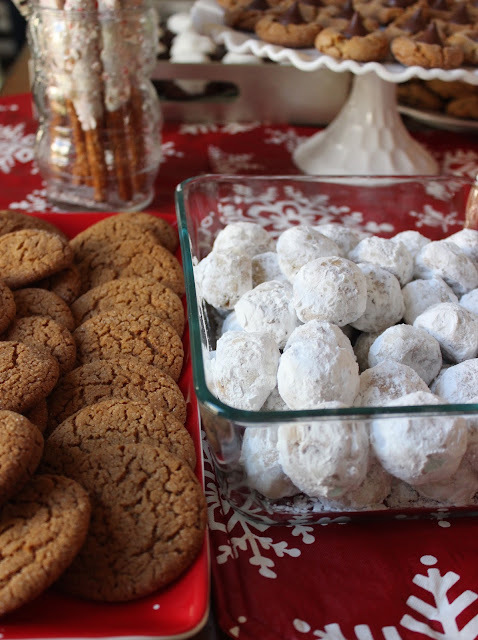 Hi friends, today I'm bringing you some tips on how to host your own holiday cookie swap party! I am no party planning expert, and these photos are by no means Pinterest worthy. 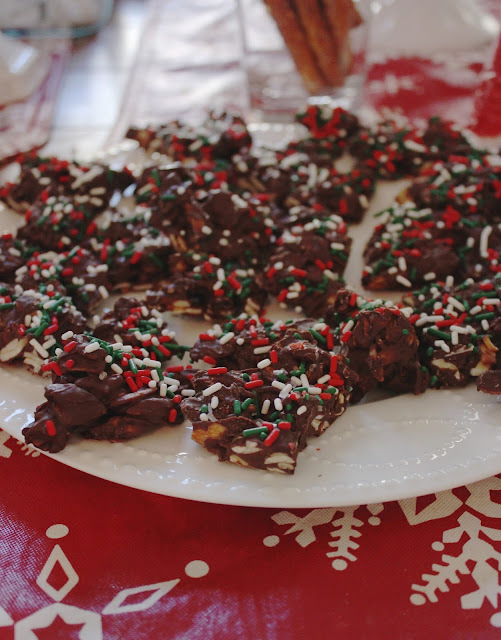 However, everyone at our cookie swap party had fun and went home with lots of delicious cookies to eat and share. So, here we go! 1.) Plan a fun decorating activity that guests can do at the party. 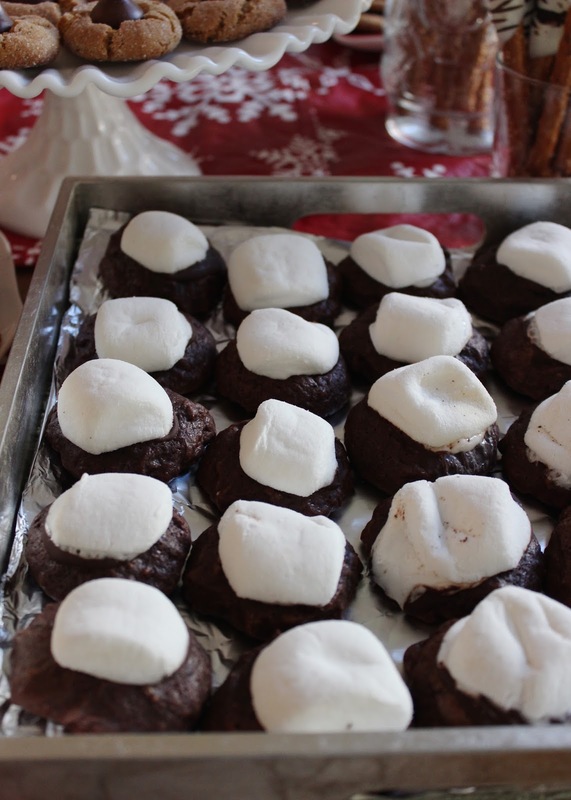 I had a smaller cookie swap party with 6 guests, so I wanted to plan a fun activity that we could do together. I thought about decorating gingerbread houses, but I quickly realized that was too much work. Instead, I baked Deb's Spicy Gingerbread Cookies and prepared icing and sprinkles. I used the tips from this post and put the colored icing into into plastic squeeze bottles for easy decorating. My friend Steph's were the prettiest. 2.) Buy pretty packaging for the cookies. 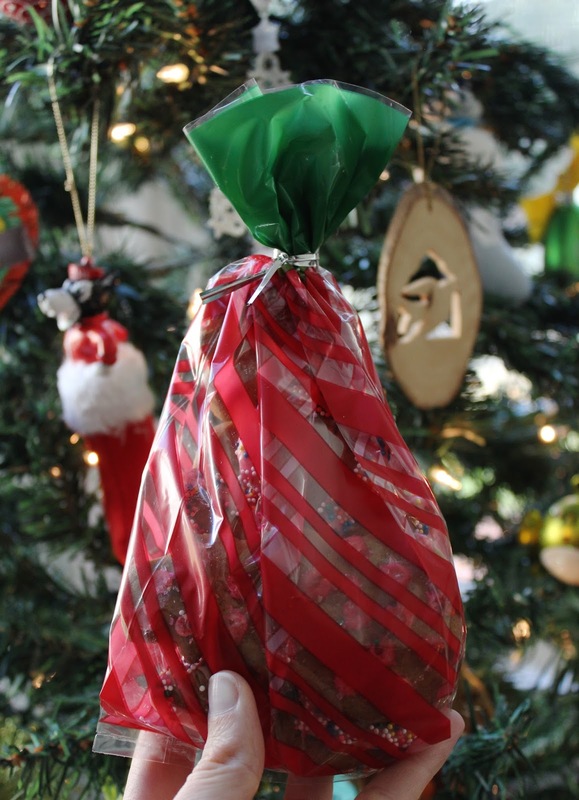 Some people took their cookies home in the tupperware they brought them in, but it was also nice to have these little gift bags ready. (I bought mine at Michael's for a couple dollars.) Everyone made a few different bags. These can be great gifts for neighbors, teachers, the mailman.....anyone! 3.) Decide how you want to collect the recipes. 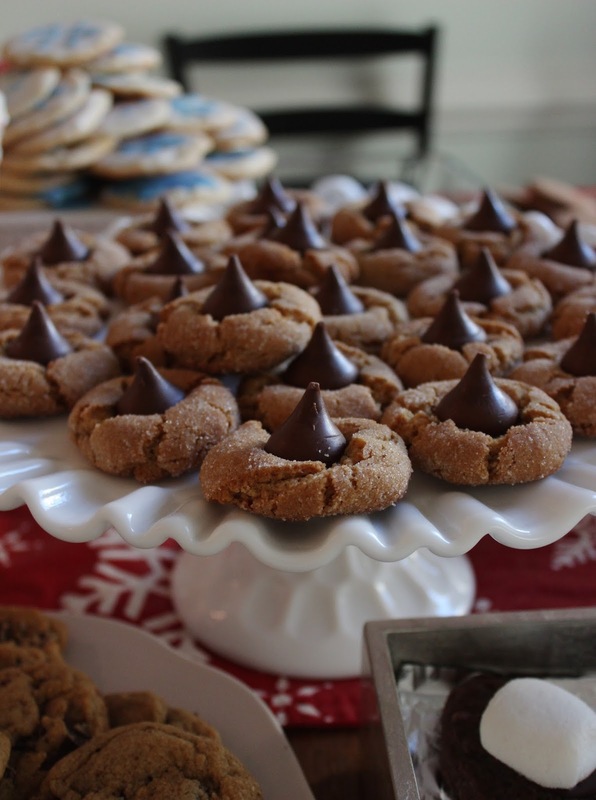 Part of the idea behind a cookie swap party is that everyone can go home with some new cookie recipes. 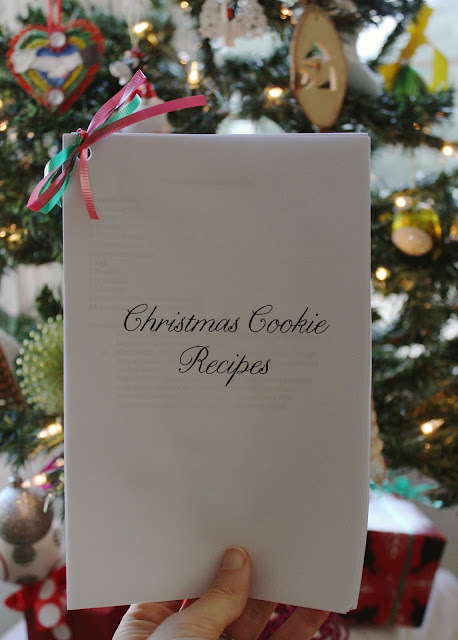 I had guests email me their recipes beforehand, and I printed them in this super simple booklet. 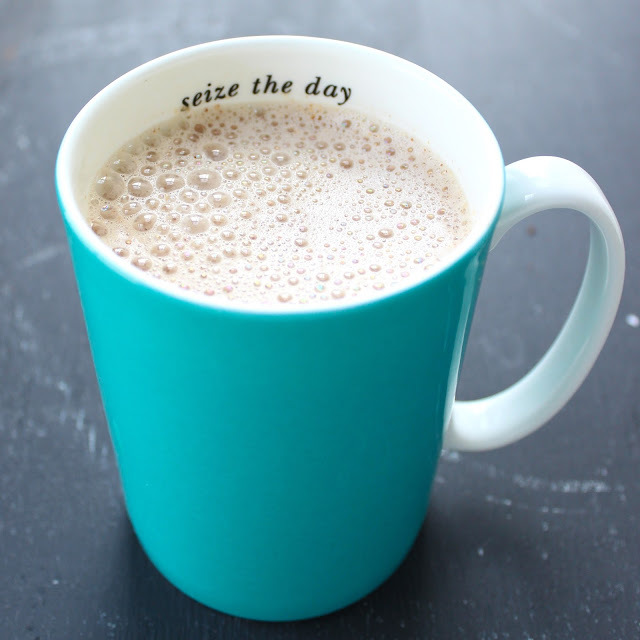 To make it easier on yourself, you could also just ask guests to bring printed copies of their recipe for everyone. 4.) Invite awesome people. Yay friends! 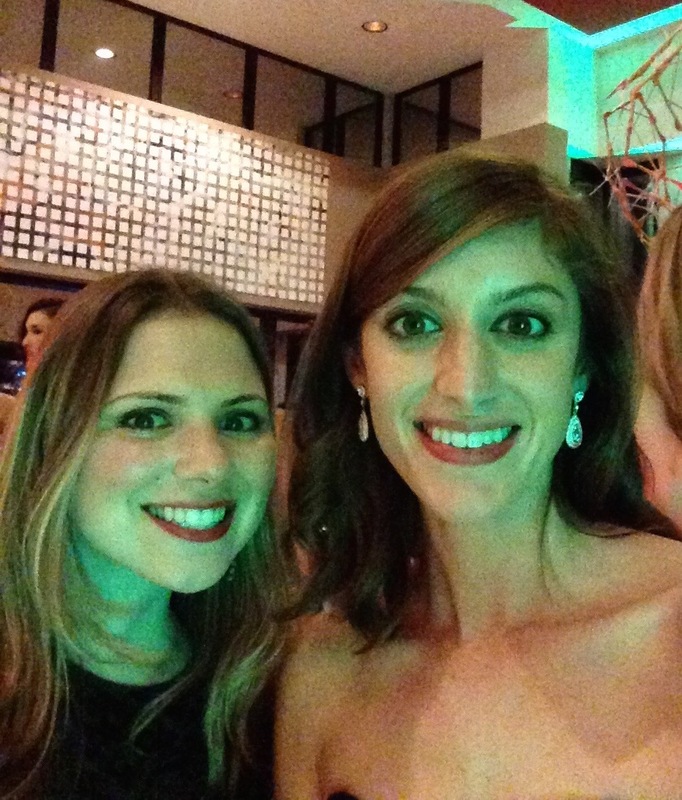 Evite and Paperless Post are great options for online invitations. I had our cookie swap party at lunch time, so I made a broccoli cheddar quiche and put out veggies & hummus and grapes. Keep it simple. Other ideas: If you're inviting a lot of people, it might be helpful to make little name cards so that people can label their cookies. This is especially helpful if anyone has a food allergy. That's pretty much it, friends. 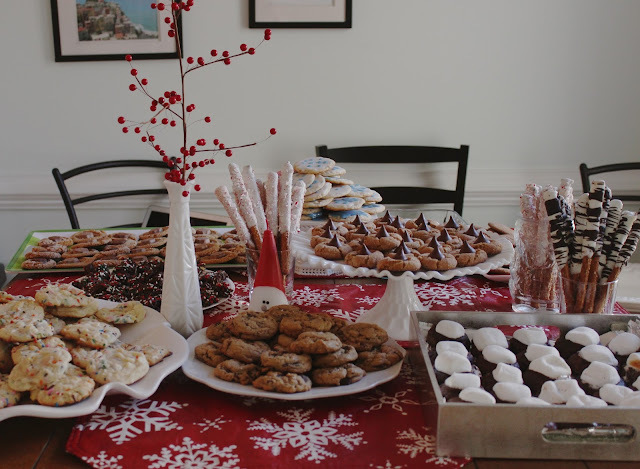 I hope you'll host your own holiday cookie swap party. 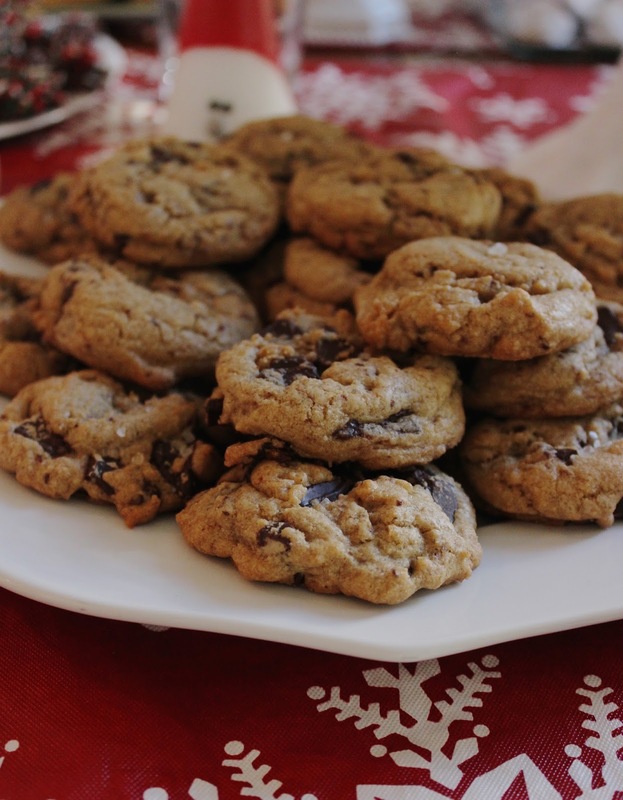 Enjoy a sample of the cookie recipes below! My Friend Nikki made up the recipe! First whisk together 2 boxes of white cake mix and 2 teaspoons baking powder. 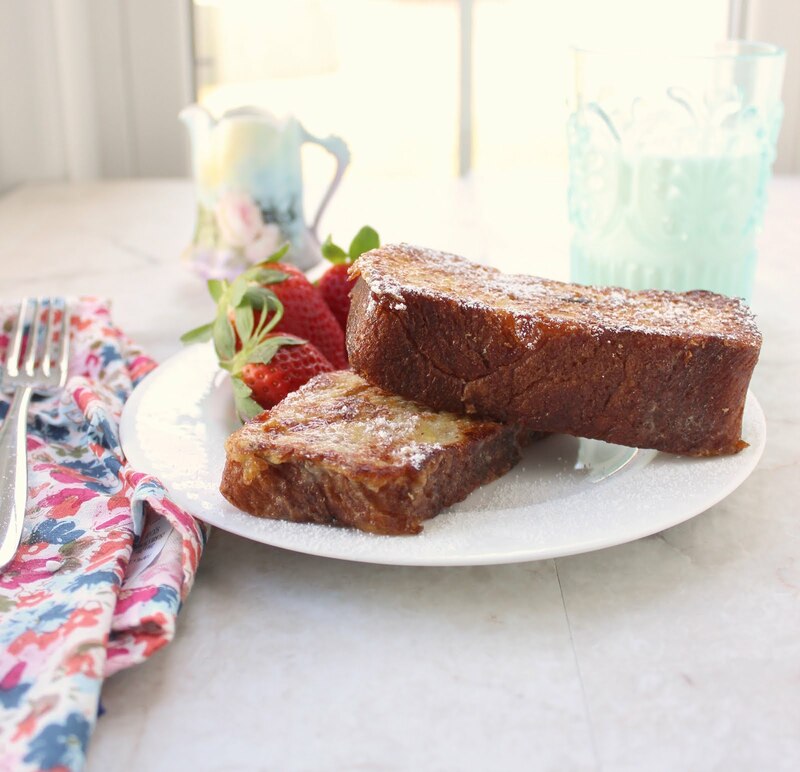 In a separate bowl, whisk together 4 eggs, 3/4 cup vegetable oil, and 1 teaspoon vanilla extract. Combine the wet and dry ingredients and stir to combine. 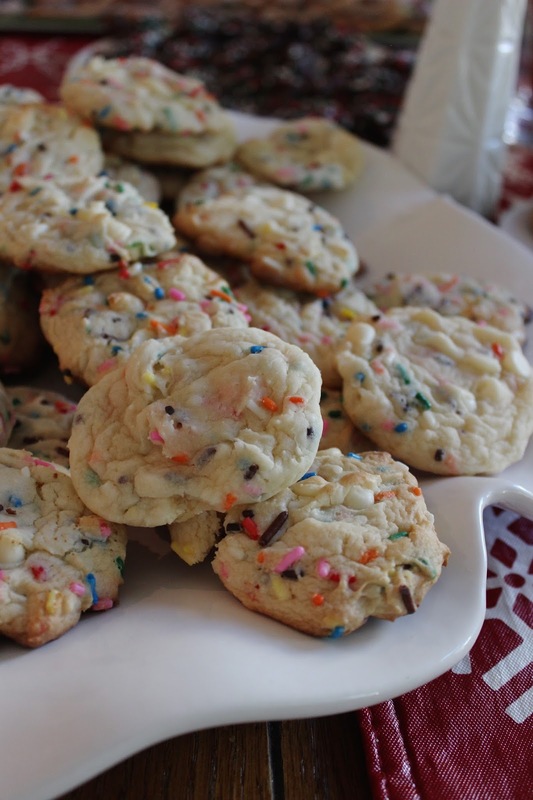 Add 1 cup sprinkles and 1 cup white chocolate chips. Bake tablespoon-sized dough balls at 350 for 9-10 minutes. And another variation on the peanut butter blossom with snowflake chocolates. One can never have too much peanut butter, in my opinion. 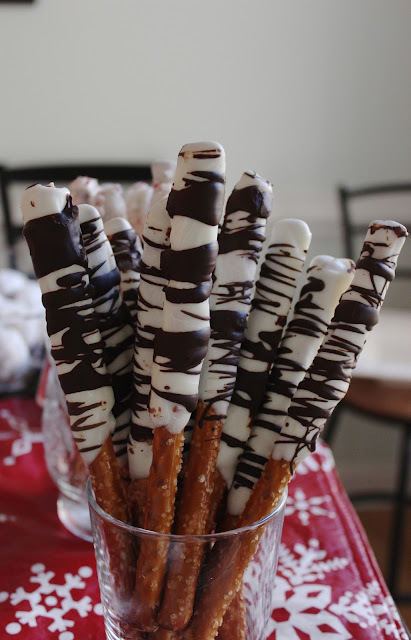 I also made a few pretzels with dark chocolate for those who don't like peppermint. 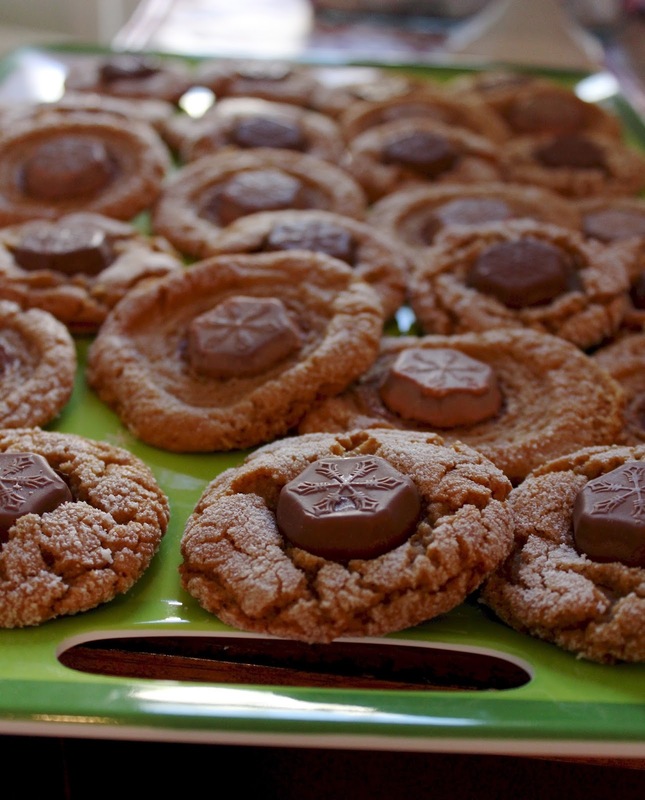 I want to know--have you ever been to a cookie swap party before? If so, what have I missed? 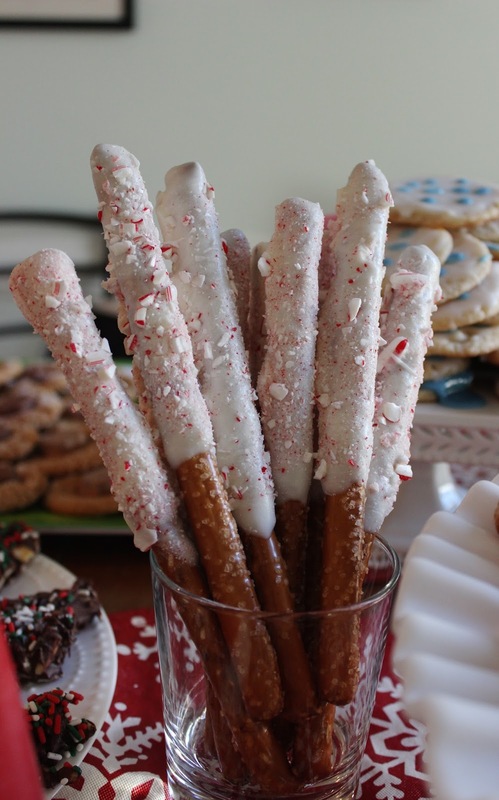 Or, what holiday cookies would you bring? One of my favorite parts of Thanksgiving is the leftovers--killer turkey sandwiches, bowls of stuffing and mashed potatoes, and of course, cranberry sauce. I know cranberry sauce is served as a sort of condiment at the Thanksgiving table, but I think it really belongs at breakfast. 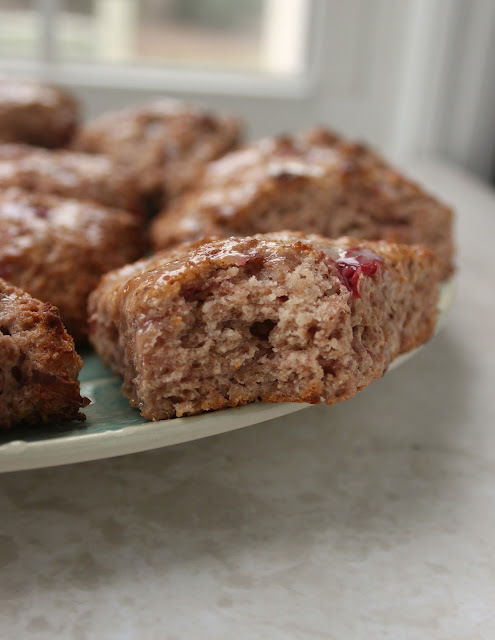 I LOVE adding a dollop of cranberry sauce to plain yogurt or to a bowl of oatmeal with almond butter in the morning. 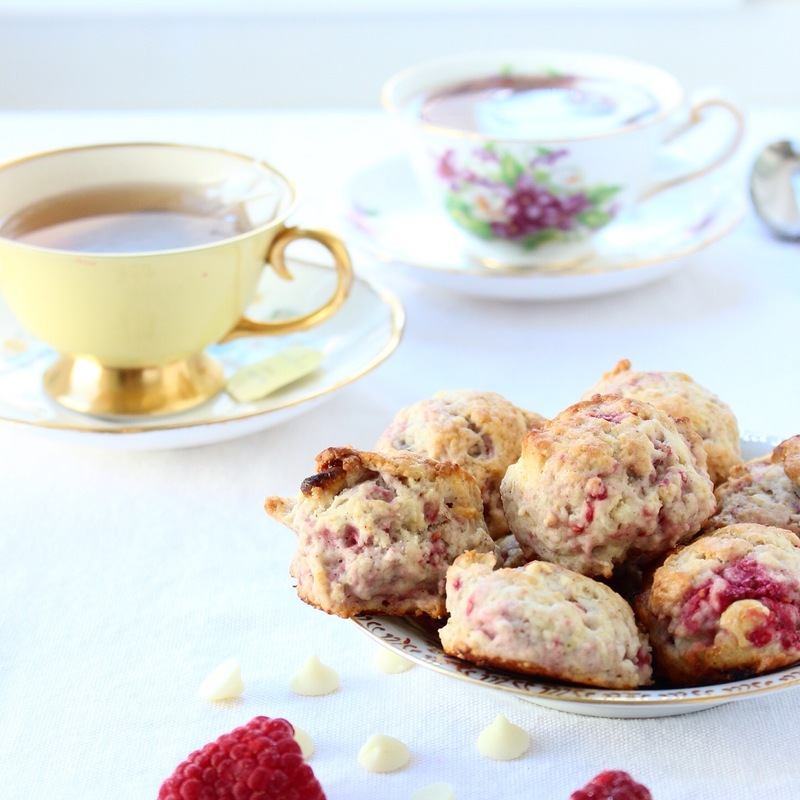 I also really love it in these scones. 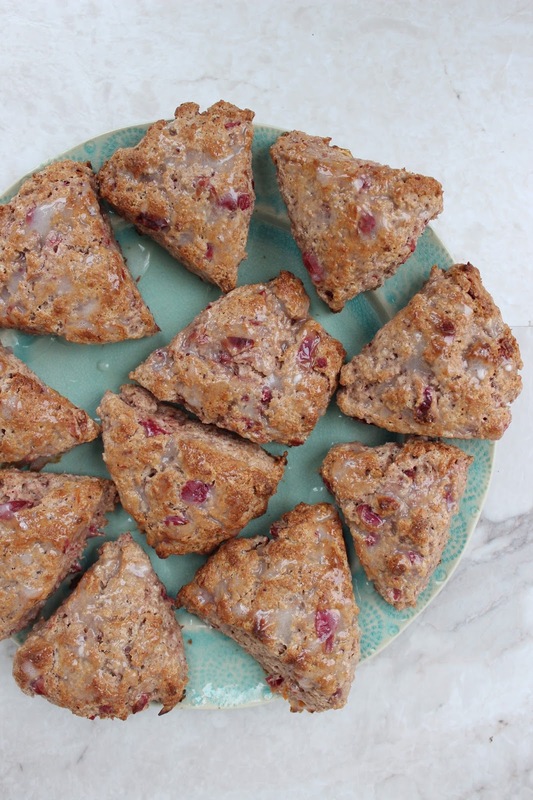 These cranberry orange scones with leftover cranberry sauce are an adaptation of my other favorite scone recipe. They've got some whole wheat flour for health and a modest amount of sugar (although we'll add an orange glaze for extra sweetness). 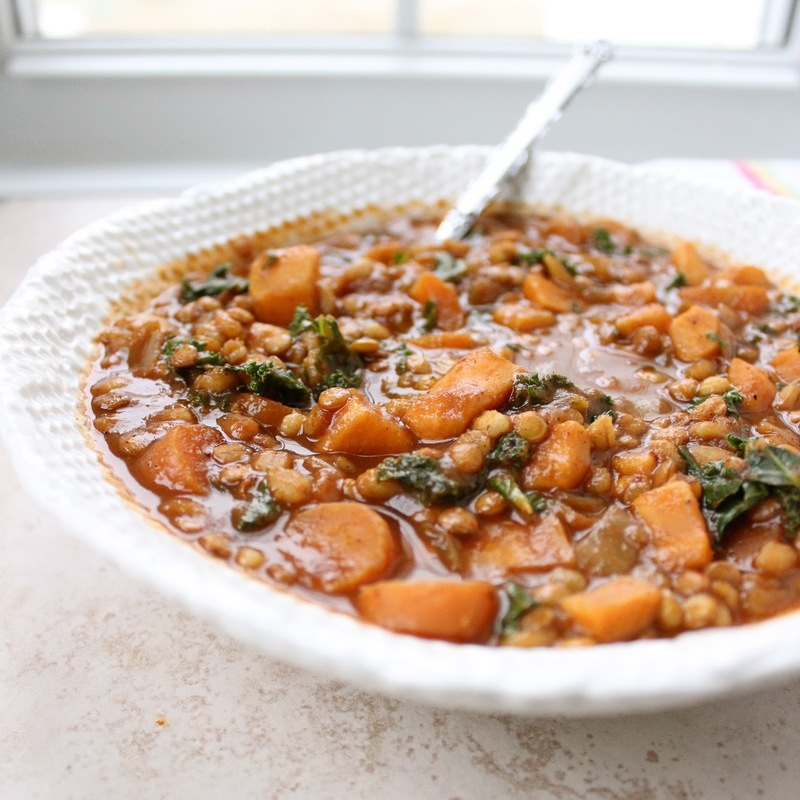 It's a simple and versatile recipe that I've yet to mess up. 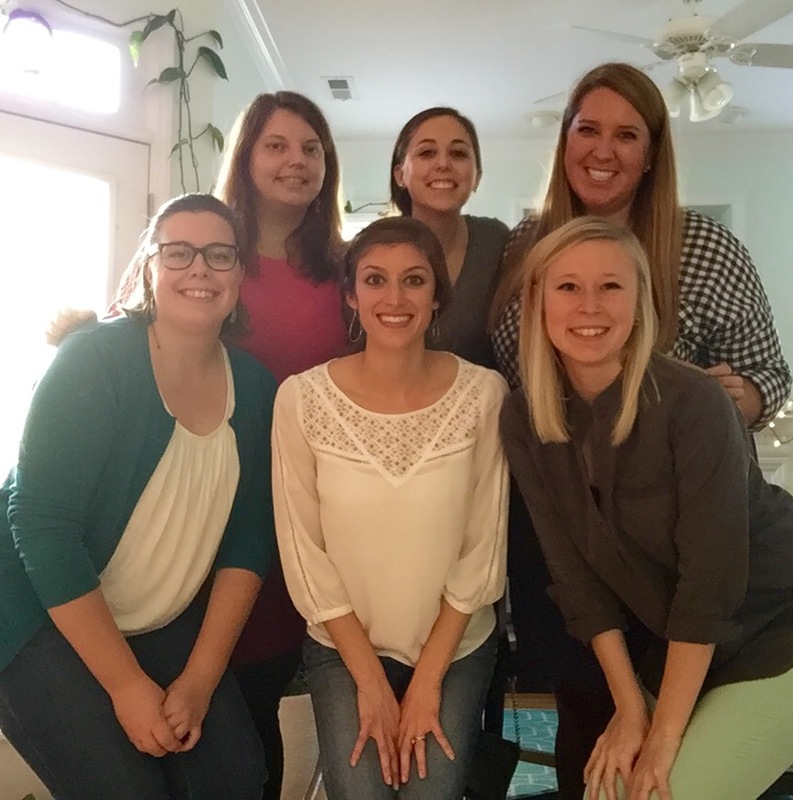 As far as cranberry sauce recipes go, I love my friend Erin's recipe for crockpot cranberry sauce. Even if you've already eaten up all your leftover Thanksgiving cranberry sauce, I think you should make more cranberry sauce to enjoy this coming week. Erin's crockpot cranberry sauce recipe is super easy. Cranberries are in season this time of year. 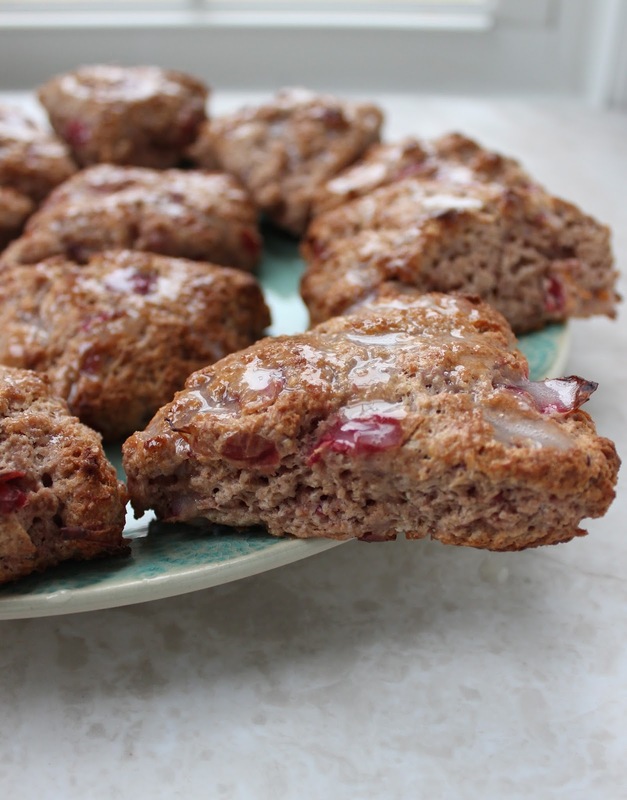 Cranberries are very high in antioxidants--even higher than strawberries, raspberries, apples, cherries, or grapes. Whisk together flours, sugar, salt, baking powder, cinnamon, and orange zest in a large bowl. Add cold butter to the bowl. Use a pastry blender or two knives to cut butter into flour mixture until butter is incorporated and in the shape of small peas. In a small bowl, add eggs, vanilla, and cranberry sauce. Beat with a fork to combine, then add to flour mixture. Stir until just combined and no flour remains in the bottom of the bowl. Prepare a cookie sheet by lining with parchment paper or spraying with non-stick cooking spray. Grab about half of the dough and use your fingers to flatten out into a 5 inch circle. Once it's on the pan, use your hand to smooth the edges. The dough should be about 3/4 inch thick. Repeat with the other half of the dough. Cut each disc in half down the middle. Then cut each half into thirds. (6 triangular slices total) Pull the slices away from each other, leaving about 1/2 inch in between. 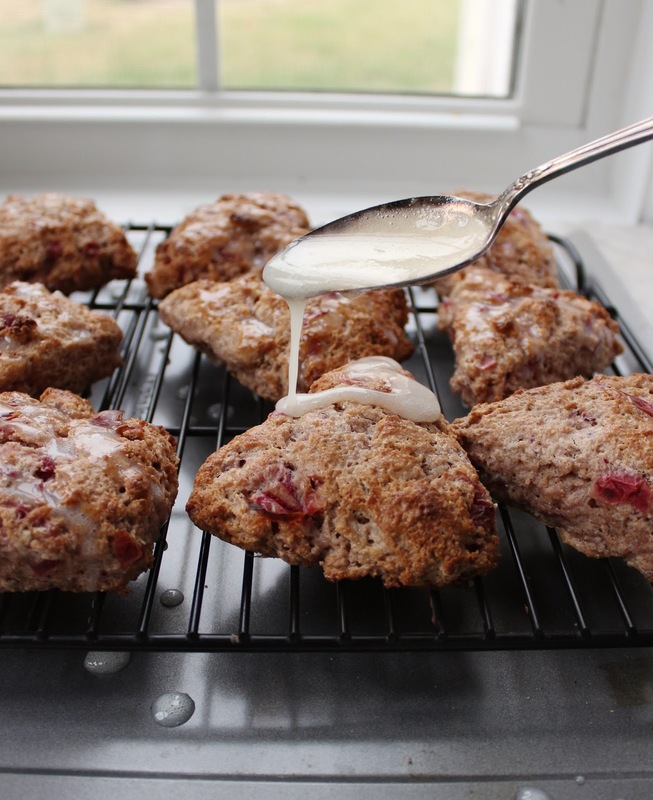 Using a pastry brush, brush the top of each scone with milk or cream. 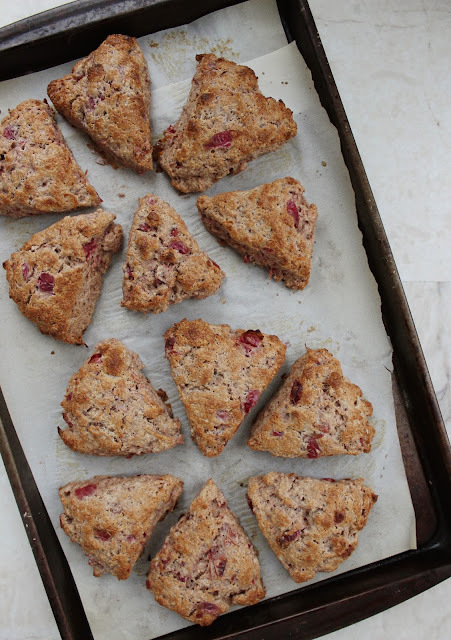 Highly recommended--Place the whole cookie sheet and scones in the freezer for 20-30 minutes. This chills the butter and ensures flakey, yummy scones. Meanwhile, preheat oven to 425. 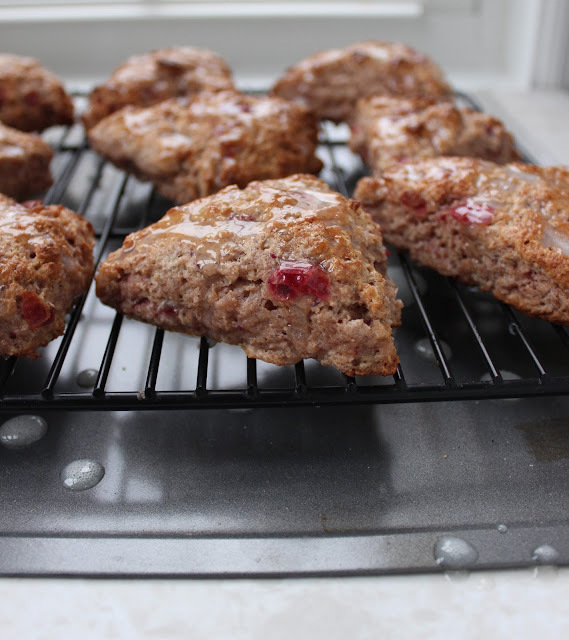 Bake scones for 18-22 minutes or until tops are golden brown. Combine the powdered sugar, orange juice, and milk in a small bowl until no lumps remain. Drizzle over warm scones. Lately, I've been feeling paralyzed about making big life decisions. 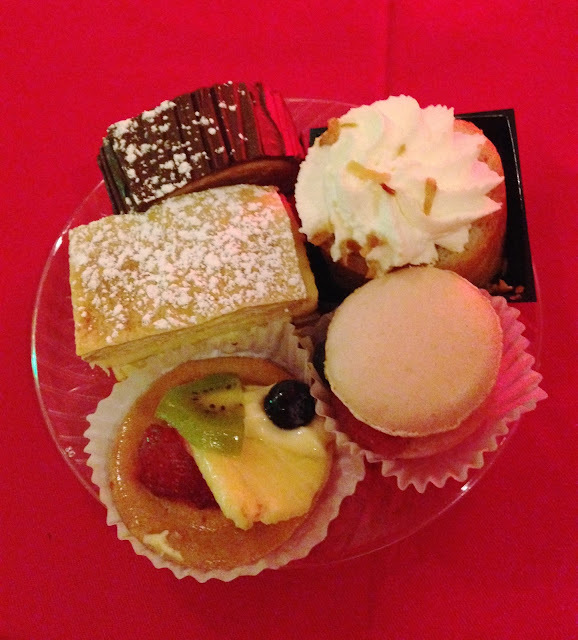 As a result, I've been baking a lot. Within the past week, I've made this whole wheat pumpkin yeast bread (for us), cinnamon swirl bread (for my ESL student), oatmeal chocolate chip cookies (for friends that just had a baby), and cranberry orange scones (for a brunch party). 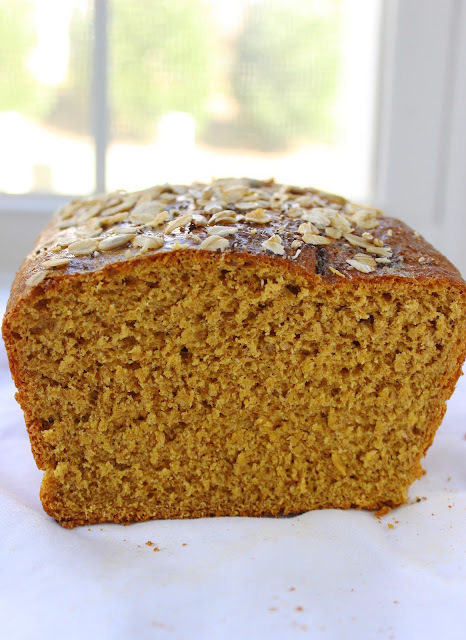 This whole wheat pumpkin loaf is the best thing I've baked all week. You might be thinking, "why go through the trouble of making a pumpkin bread that requires yeast and 2 hours of rise time when I can just make a pumpkin quick bread so easily?" I love quick breads, I really do. But they're dense and sweet and predictable. 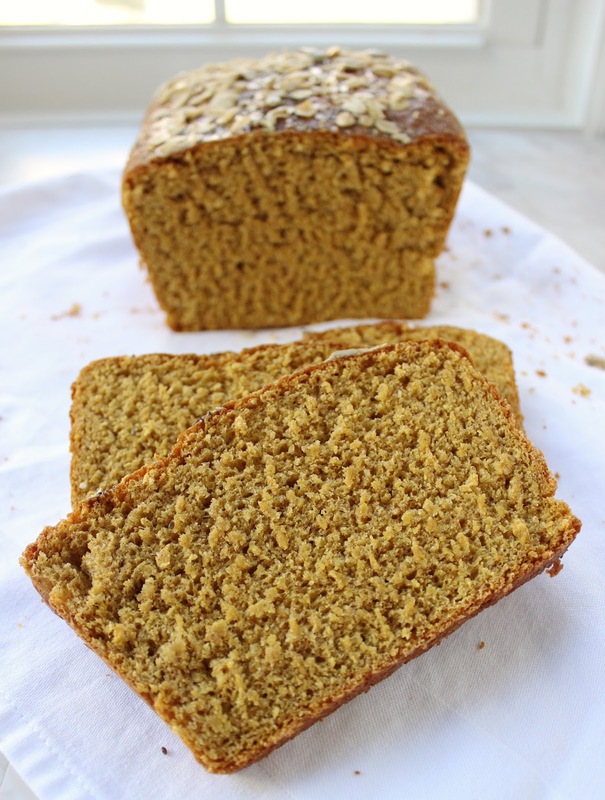 This pumpkin yeast bread is airy, soft, and decidedly worth the fuss and the rise time. When everything is confusing and uncertain, it's comforting to make something tangible with my hands, something substantial, and good. 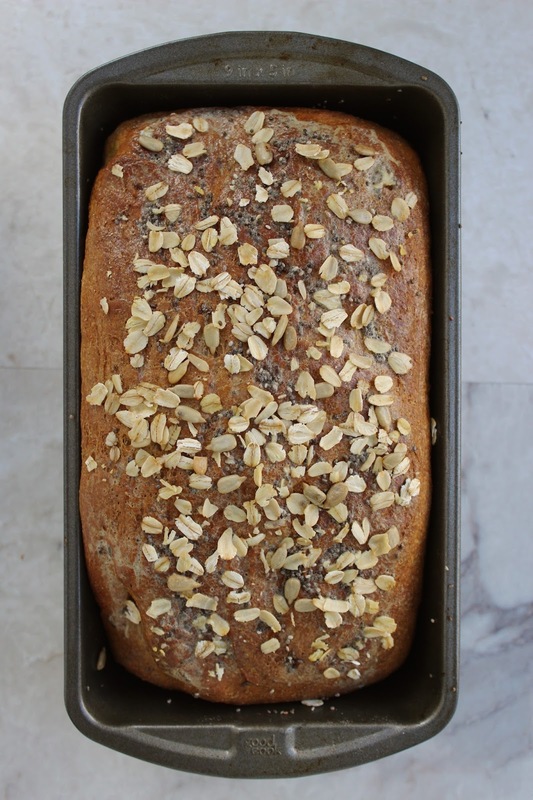 No matter what kind of week you've had or what kind of week lies ahead, the smell of this bread baking will make you feel as if everything is right in the world, even if just for a moment. Have a wonderful Thanksgiving! 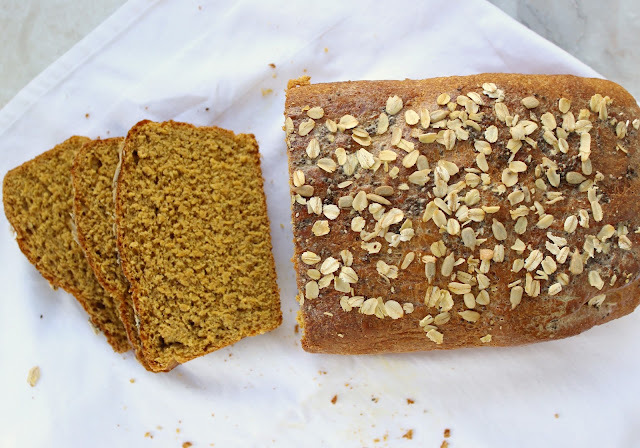 I'll be making pumpkin whole wheat rolls with this recipe as well as strawberry pretzel cheesecake. 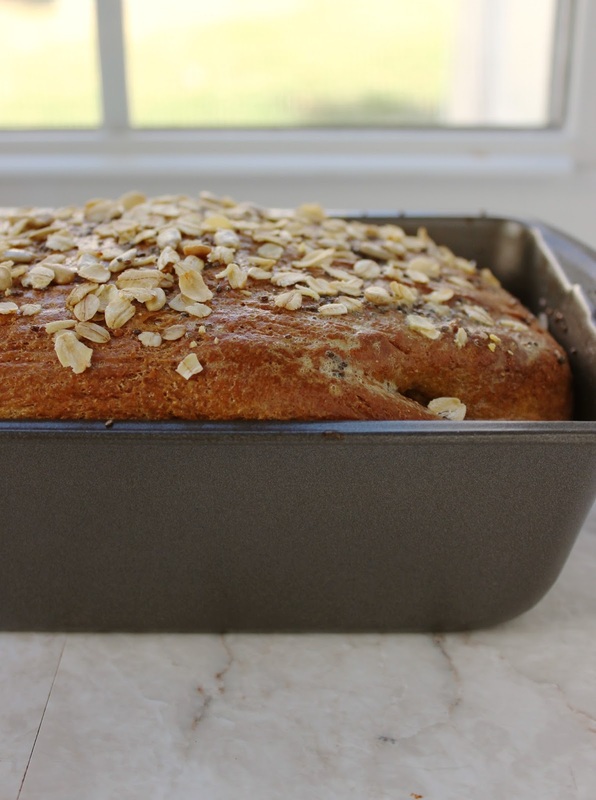 Prepare a clean surface on your counter and sprinkle with flour. Prepare a large bowl by spraying it with non-stick spray or olive oil. In a medium bowl, add the yeast and hot water. Stir gently for a moment and then let sit for 5 minutes. Add the sugar, vegetable oil, and pumpkin. 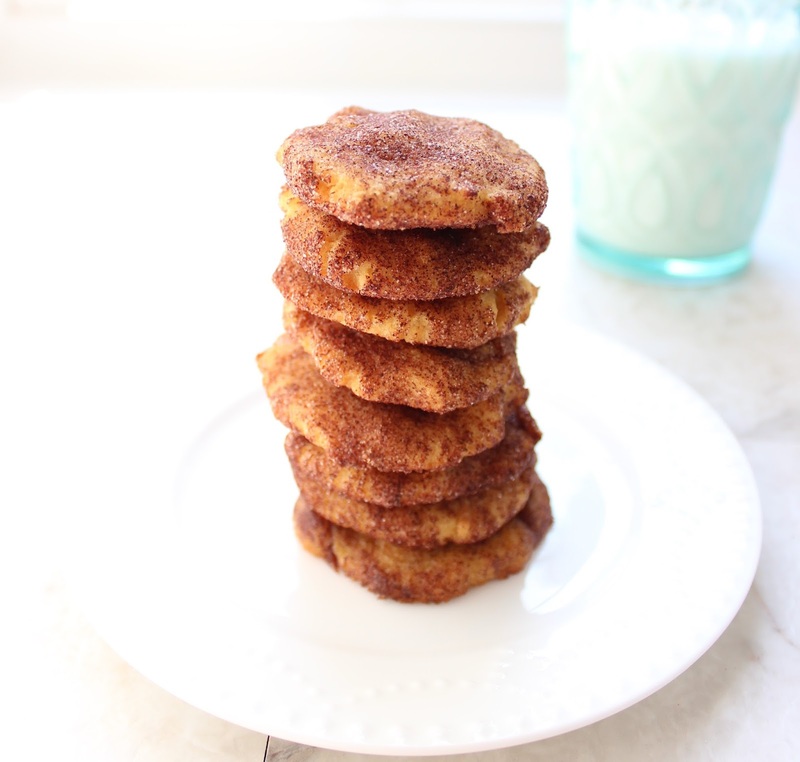 In a separate bowl, whisk together the flours, salt, ginger, allspice, and cinnamon. Add the flour mixture to the west mixture. If the dough is very sticky, add another tablespoon or two of flour until the dough is soft and smooth. Turn dough onto a cleaned floured surface and knead for 5-6 minutes. Dough should be smooth and elastic. 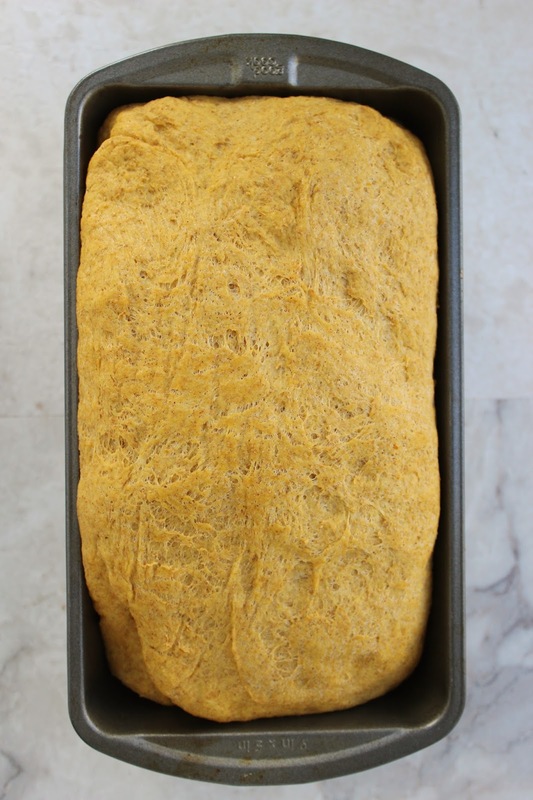 Punch dough down and shape into a loaf size. Transfer to a greased 9 by 5 loaf pan. Cover the pan and return to a warm place to rise for an additional 45 minutes-1 hour. The dough should rise about 1 inch above the rim of the loaf pan. Preheat oven to 350. Brush the top of the bread with the egg. 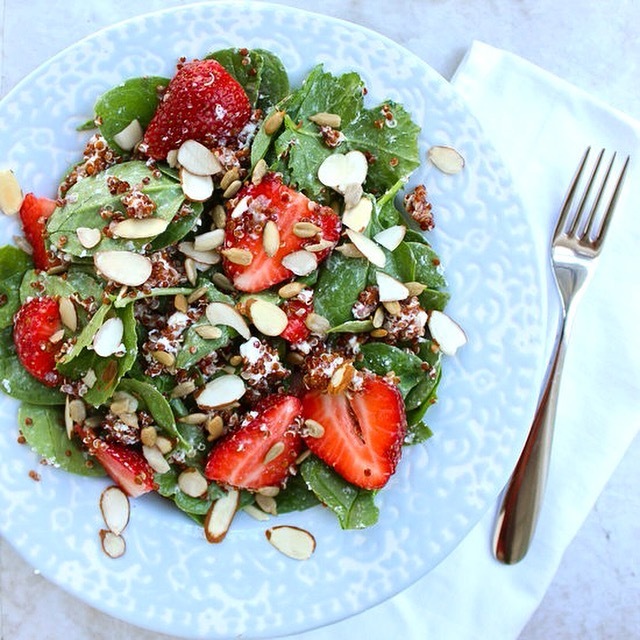 Sprinkle with assorted seeds and nuts. 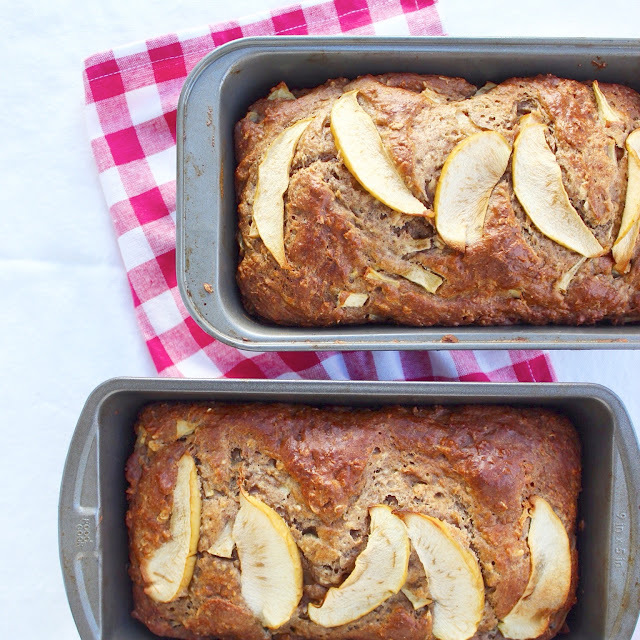 Bake for 35-45 minutes. 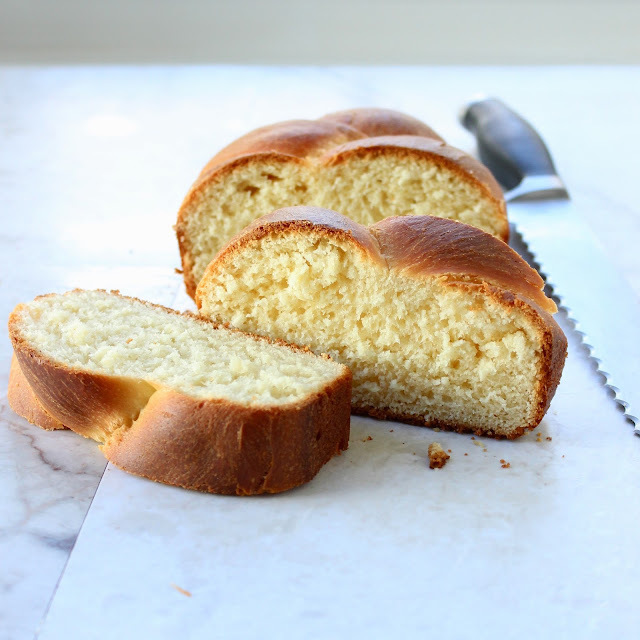 Test dough by giving the top of the loaf a thump with your finger. It should sound hollow! Let bread cool for about 5 minutes before removing from pan to cool on a wire rack. Let bread cool completely before slicing.